Find your way around inside the shell. Create, move, rename, delete directories. Create, move, rename, delete files. Bulk copy, move files and directories. This is the most important and, perhaps, most easy thing. While working with console (or terminal), most of the commands are executed on the current working location (if not otherwise mentioned), so it becomes important to know your working location before executing any command. This is basically called present working directory and can be printed on the terminal window by executing the pwd command. It works on your location, gets it absolute path and prints it on the screen. while working inside the said directory. Let us consider we are working under /home/user directory. Now we want to write the path of public_html directory under it. If we want to refer inside the directory, then we append a front-slash after it. 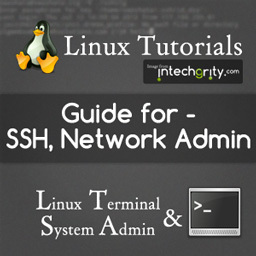 Although, you might think it is not needed, but it becomes helpful to check whether the path is of a file or a directory. 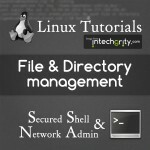 In Linux file system, everything, including directories, are treated as a file. So, you can not have a file and a directory at the same path with the same name. We can simply use ls command. For other directories, replace / with the path of the directory. Common file and directory operations involve, creating, moving, deleting and renaming files and directories. Creating a file involves invoking a terminal based text editor. There are many, but common are vi and nano. I personally prefer nano, as it is light-weighted and simple to use. Start the nano editor with the file-name as command line argument. This will give you an editor screen like this. Create and edit the file. To save it press Ctrl + O. This will confirm you for the path, press enter and the file is saved. To exit, press Ctrl + X . Then, it will output the string ‘<?php echo “Hello World!”; ?>’ on the screen. Now, we are going to use a redirection operator > to redirect the output to a file. Touch is basically a tool to change file timestamps. It updates the timestamp of a file to the current system time. If a file is not found, then it will be created. To create a directory, we simply use the mkdir command. But for different situations, it behaves a bit differently (better said, accordingly). For files, it is simple. Note that in this case, the destination directory www should be present. Otherwise, a new file, named www will be created inside the /var directory. Easy? Now let us see the usage of the same function for directories. Say we have a directory named foo inside pwd. We want to move it to rename it to bar. If the directory bar is already present, then foo will be moved inside it. If there is a file present named bar, then it will throw an error. Otherwise, the same will be renamed. Say, we want to move the directory foo to the /var/www. From the last discussion, you should be able to answer it yourself. Again, if the directory www is not present inside the /var then, the foo will be moved to /var and will be renamed to www. Just keep these things in your mind while working with mv. The command cp can copy files and directories to a new location with a new name. Here are some example. If www directory is not present, then a file named www will be created inside the /var directory and will have the same content as foo.php. If www is a file, then it will be overwritten. For copying directory, we need to append -r to the command. It tells to recursively copy all the directories and subdirectories and files inside it. 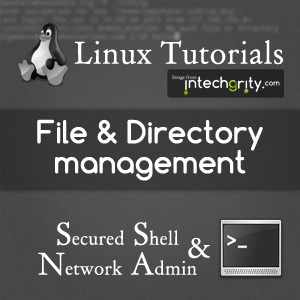 For deleting files and/or directories we can use rm command. If a directory is empty, then we can also delete using rmdir command. It requires to append a -r to the rm command. For safely deleting empty directories, we use rmdir. The above will delete first the foo/bar/mydir making foo/bar empty. Then in the same way it will delete foo/bar and foo. If any of the directory is not empty, then it will produce an error and will not delete it. The above were almost everything about single file/directory operation. But in many cases, you might want to bulk move and/or copy. In such cases, we use filename wildcard. In simpler word, if we want to represent anything for a filename, we use the wildcard *. Similarly, if we want anything followed by bar in the filename, we use *bar. Also, if we want to refer to all .php files, then we use the filename wildcard *.php. It will also produce a notice saying Omitting directory `bar/dir’ if any directory is present inside it. This will also overwrite if anything is present. This will produce a notice if, say a directory named, abc.bak was present. As said earlier, rm, alone, can not remove a directory. Be careful while using this command. This can (and will if permission allows) recursively wipe clean all files and directories. and it will give you everything you need. Also, you can ask here in the comments if you are facing any trouble. That’ll be all for this. Hope you find it useful and do give your feedback. This is nice and clear!! thanks!! !